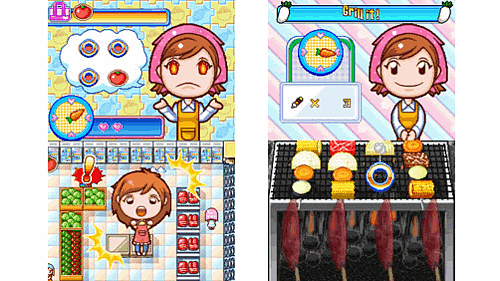 Cooking Mama brings fun to the kitchen, with its light-hearted approach to culinary chaos. And as it's on the Nintendo DS handheld console, the cooking action can take place anywhere! 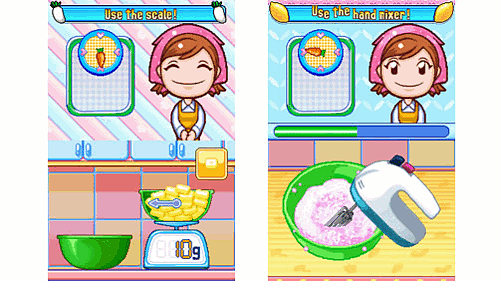 Cooking Mama brings fun to the kitchen, with its light-hearted approach to culinary chaos. And as it's on the Nintendo DS handheld console, the cooking action can take place anywhere! Under Mama's watchful eye you've got to cook up a storm; use the Nintendo DS's unique touch-sensitive screen to slice, stir and flip the ingredients in the pan to get the recipe right. Cooking Mama 3 features 80 new recipes and an entirely new shopping mode – which takes the Cooking Mama mayhem to the supermarket. The massively popular Cooking Mama series has already served more than four million satisfied customers on the Nintendo DS and Wii. Cooking with Mama in a whole new way! People of all ages have discovered the fun that Mama brings home, and she’s only just getting started. Mama’s ready and will show you new challenges, game modes and recipes in Cooking Mama 3. Challenge Mama to create new recipes, shop for the best ingredients and give yourself a chance to fix your mistakes before Mama does. With improved graphics, gameplay and multiplayer modes, everyone will love the latest outing with Mama. 200 mini games with over 80 recipes! New tool’s and cooking methods including barbecue, electric mixer and more. Let’s go shopping! –Mama sends you to the shops to get ingredients –will you be able to remember what she needs? Let’s Match! –Choose you ingredients and see what Mama comes up with. Let’s Shop! –Fetch the food for Mama’s kitchen. Cooking contest! –Challenge Mama in a madcap race against time. Challenge mode! –Mama’s going to set you a challenge, can you clear it in time?